The PyeongChang Paralympics proved to be more than an encore for the Winter Games, as 10 days of festivities showed fierce competition as well as sportsmanship demonstrated by athletes from across the world. The biggest multinational parasport event in the world will hold its closing ceremony Sunday at the PyeongChang Olympic Stadium in Gangwon Province, which hosted South Korea’s first Winter Games last month. The ceremony was to be held under the theme of “We Move the World,” following the message “Passion Move Us” from the opening ceremony. Artists Kim Chang-wan Band, Ailee and countertenor soloist Lee Hee-sang, along with pianist Kim Ye-ji and ballerina Go A-ra -- who are visually and audibly impaired, respectively -- will perform onstage to wrap up the Paralympic Games that kicked off on March 9. An art performance from Beijing, the host for the next Winter Games and Parlaympics, also will take place. The PyeongChang Paralympics were the biggest of its kind, with 597 athletes from 49 countries fighting for 80 gold medals, each of which numbers are records for Paralympics. It also proved to be the most successful in terms of ticket sales, with 335,000 tickets sold, surpassing 316,200 in Sochi and raking up 6.6 billion won ($6.2 million) in revenue, according to the organizers. The South Korean team managed to garner one gold and two bronze medals to finish 16th overall. While it fell short of its initial goal to finish in the top 10, it marked the first time the country had won a gold medal in the Paralympics. 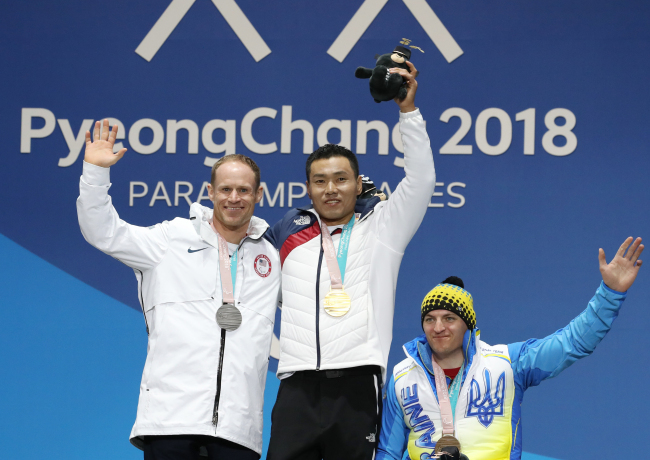 Nordic skier Sin Eui-hyun earned his place in the country’s sports history by winning the men’s 7.5-km sitting cross-country skiing on Saturday, becoming the first Paralympic champion in Korean history. He also won the country’s first medal in PyeongChang with a bronze in the men’s 15-kilometer sitting cross-country skiing last Sunday. Men’s ice sledge hockey brought home the other bronze medal at Italy’s expense on Saturday. The PyeongChang Paralympic Games also saw three countries making their Paralympic debut -- Georgia, Tajikistan and none other than the reclusive North Korea, who has recently been showing signs of communicating with the outside world after years of belligerence. Sit skiers Kim Jong-hyon and Ma Yu-chol finished last in the 1.1-kilometer sprint cross-country skiing to return home empty-handed Thursday, but they made history by becoming the first Paralympians of the communist state. While South and North Korea did not enter the stadium together at the opening ceremony like they did at the Winter Olympics, Ma and South Korea’s Choi Bo-gue jointly showed a moment of reconciliation as they held the Paralympic torch together before the cauldron was lit. Sports powerhouse US finished the Paralympics at the top of the pack with 13 gold, 15 silver and eight bronze medals, while Russia -- competing under the name Neutral Paralympic Athletes” -- Canada, France and Germany followed. The highest honor among the individual athletes, the Whang Youn Dai Achievement Award, will be presented to para alpine skier Adam Hall of New Zealand and para Nordic skier Sini Pyy from Finland by Dr. Whang Youn-dai herself. Despite the overall success, there were some low points at the games. The three major broadcasters in South Korea, MBC, KBS and SBS, failed to broadcast the historic moment when skier Sin won the country’s first gold medal because they were all broadcasting the men’s ice sledge hockey event held at the same time. The broadcasters also failed to televise the moment when Sin won his bronze medal last week. South Korean President Moon Jae-in, a day after Sin won the bronze, said in a meeting with his aides that he wished the local channels would broadcast more Paralympic Games.